A flexible independent rail tour package with 3 nights in Rome and a fascinating Rome walking tour included. Pre-paid train ticket From Rome to Monterosso in the beautiful Cinque Terre with 2 nights accommodation. 2 days unlimited access to the hiking trails, shuttle buses and regional trains on the Levanto – Cinque Terre – La Spezia line. Transfer from Rome airport or rail station to your hotel. Breakfast at the hotel. In the morning enjoy an orientation tour of the Rome city center. Reach the meeting point of the tour 15 minutes prior to the departure (pick-up from hotel not provided) and enjoy a 3- hour walking tour including Campo dei Fiori, Piazza Navona, Pantheon, Trevi Fountain and Spanish Steps. Rest of the day at leisure. Optional afternoon / night sightseeing tours are available. Breakfast at the hotel and then a day of leisure. Optional tours in the city or to Naples and Pompeii are available. Breakfast at the hotel and independent transfer to the Rome rail station where you will board your high- speed train to the Cinque Terre (with a train change in Pisa or La Spezia). With your “Two- Day Cinque Terre Card & Train”, you will have an easy and fast access to all the stunning villages in Cinque Terre. This includes train, park shuttle buses and the beautiful hiking trails. Upon arrival in Monterosso / Levanto, transfer on your own to the hotel. Rest of the day at leisure. Breakfast at the hotel and a day of leisure. You can keep exploring this destination on your own (with your card) or join optional tours, boat tours and other activities. Or you can simply hike the trails between villages and enjoy a meal in one of the lovely seaside restaurants. Breakfast at the hotel. End of services. 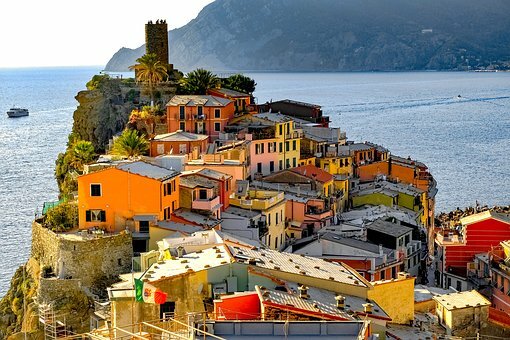 2 days Cinque Terre Card & Train – 2 days of unlimited access to the trekking paths, ecological shuttle buses, WIFI connection and unlimited regional 2nd class train travel on the Levanto – Cinque Terre – La Spezia line. 7 nights bed and breakfast basis & 1st class high speed train tickets. Except local train from La Spezia or from Pisa. 7 nights bed and breakfast basis & 2nd class high speed train tickets. Except local train from La Spezia or from Pisa. Please note additional night’s accommodation can be added to this tour.